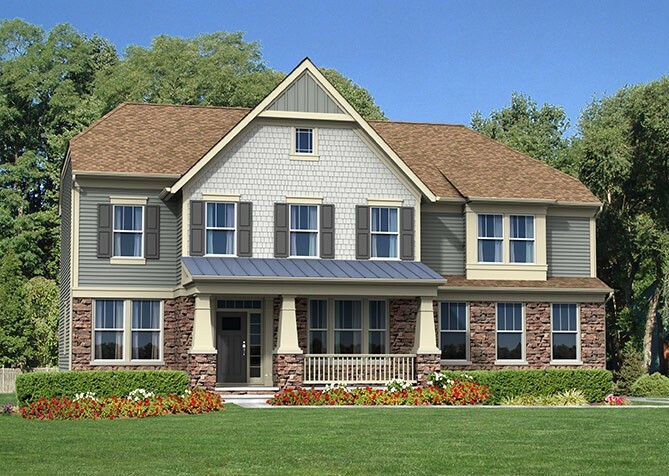 THE KENNEDY - Starting from $442,900 4 - 6 Bedrooms / 2.5 - 5.5 Bathrooms / 3,391 - 5,766 sq. ft. The Kennedy model offers the perfect combination of dramatic impact and casual elegance. The 2-story entry and extra wide foyer, flanked by open dining and living spaces, lead to a circular foyer extension, where guests can marvel at the soaring 2-story family room in front of them, beaming with natural light radiating from 2 stories’ worth of windows. An elegant butterfly staircase offers access to the second floor from the foyer and the kitchen – a chef’s dream, with an oversized center island anchoring the room, surrounded by three long expanses of cabinetry. Upstairs, an impressively spacious master suite with the option to add a private sitting room, three additional bedrooms and second-floor laundry await. Square footage from 3,391. Starting from $442,900.